Smart growth could increase Fresno’s tax revenue by 45 percent per acre. In Champaign, Illinois, it could save 23 percent per year on city services. Study after study has demonstrated: Walkable, mixed-use development is a much better deal for municipalities than car-oriented suburban development. Smart Growth America recently conducted an analysis of research examining the impact of efficient development patterns on municipal bottom lines. The authors looked at 17 case studies, from California to Maryland, and, taken together, they say the findings clearly illustrate how walkable development leads to healthier city budgets than drivable sprawl. For starters, smart growth is cheaper to build. On average, municipalities save about 38 percent on infrastructure costs like roads and sewers when serving compact development instead of large-lot subdivisions. Furthermore, SGA researchers say, “this figure is conservative, and many communities could save even more.” In the case studies, these upfront cost savings ranged from 20 percent to 50 percent. The public savings don’t stop once projects get built. Mixed-use projects also reduce ongoing costs to municipalities for services like police, fire and trash. Smart Growth America estimates the average savings at almost 10 percent. Charlotte, North Carolina, for example, found that fire department response times would be faster and fewer stations would be needed if the city had a better-connected street grid and closer-set homes. The savings would be significant: It can cost as much as $740 per year per household to provide fire protection services in a suburban environment, and as little as $159 per year in a more compact neighborhood. The study found, further, that smart growth conditions would allow the city to forgo building two fire stations. The up-front construction savings would come to $13 million, while the annual savings from not operating those two fire stations would total about $8 million. Every study Smart Growth America examined similarly showed that locating residences closer together, with better integrated street patterns, reduced costs for the municipality. Finally — and this is the most important part — smart growth provides a better return for cities and taxpayers. SGA’s analysis showed that walkable development generates about 10 times more tax revenue per acre than traditional suburban development. This “alleviates the pressure to raise taxes, which is pressure we feel across the country,” said Fulton. A case study from Sarasota, Florida, compared a downtown development with a suburban development of a similar scope. The study found that the downtown development would pay for its costs to the municipality in three years, while the suburban development would take 42 years. “This means that smart growth development can pretty dramatically flip what is a deficit for taxpayers, and turn it into a surplus,” Fulton says. As we reported a few weeks ago, a case study conducted by SGA in the Nashville region showed a similarly stark contrast. Comparing a dense, mixed-use downtown development to traditional suburban sprawl, the study found that smart growth returned 1,150 times more tax revenue per acre to the municipality. All in all, SGA estimates, about a third of local government expenses are directly affected by land use decisions. The first time I played Sim City as a kid, I built some houses and a long road that went to some commercial and industrial. It was very spread out. My road maintenance budget was huge and I went bankrupt soon. Now if cities would transfer some of the benefit of increased efficiency to the residents. ie you pay taxes proportional to the amount it cost to provide services to you. That way residents in compact areas pay less taxes then residents in more spread out areas and the residents in compact areas aren’t subsidizing the residents in less compact areas. I would love to not have to subsidize motorists and suburbanites/exurbanites. Not only would I save a ton of money, but it would help make it apparently how utterly stupid their choice of living arrangements really is, as the entire cost burden of the sprawl would fall on those who create it. Moreover, despite what Americans insist: When they vacation—apart from the resorts, sports holidays, or family functions and business, they choose cities. Whether it’s NYC or Paris, or Tokyo, people gravitate to cities. Nobody plans and saves for a year or more to visit Walnut Creek or Levittown, unless they have business there, or in the case of the latter, are looking into the roots of the ‘burbs. If cities were so awful, people wouldn’t vacation in them, that they don’t vacation in suburbia says a lot. And I like the idea of taxing proportionally as other commenters have suggested: Make the burbs pay for the true cost of their wasteful existence. So true. People are realizing it is a ponzi-scheme of development. The only way to pay for those enormous infrastructure costs is to build another ‘hit’ of suburban development. The whole apparatus crashes when there is a slowdown in home sales, collapse of housing prices, or you run out of land. 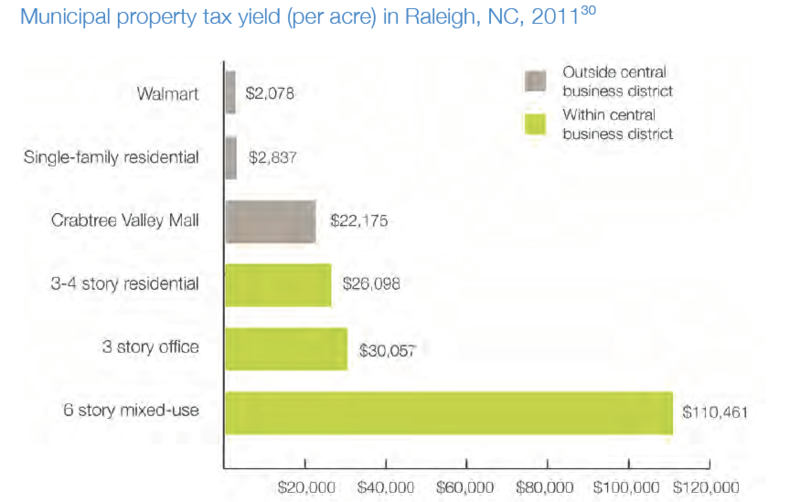 I hate to say it, but fiscal impact analysis isn’t about taxes per acre, it’s about taxes per school child. That what the exclusionary zoning states — the blue states, ironically — seek to avoid — less well off children who will get services in school in excess of taxes paid. Hence the preference for age restricted housing as a way to get multifamily approved. Or laws such as Chapter 41B in Massachusetts, which bribe/push localities to accept multifamily development, because the business community is worried its labor force is being priced out of the state. In an effort to avoid working class people with children living in apartments, localities price out those who grew up there. So why do so many people choose to live in the suburbs? Do they predict their own costs will be lower? Would people choose to live in mixed-use areas if their costs were the same as in the suburbs? This article is a great tool, but someone needs to put it to use. In this case, people might love things to change just enough that they can reasonably choose a home in a mixed-use area. It only takes a small group of leaders to change civic policy…especially when they get large numbers of people to stand with them. “Experts” have known this for a long time. Urban planning literature from at least as far back as the 1930s have noted this. The trouble, even today, is getting the decision-makers (i.e., politicians) to act on it. I sometimes wonder, do Americans prefer car-oriented, suburban living because they like the feeling of owning a piece of the USA, and having the the feeling of control that a steering wheel gives, or have we been brainwashed by the automobile and real estate industries? Have we been convinced that “renters are second-class citizens”? I read about entertainment moguls and movie stars who live in Brentwood mega-mansions and think–did they grow up in a small apartment with one bathroom for a growing family? Did they swear on a stack of real estate ads, “God as my witness, if I make it big in Hollywood, I’ll never be cramped again!”? Honestly, I think it’s because they’ve been brainwashed. I’ll admit I prefer a home over an apartment (mostly because you often get your neighbor’s roaches in an apartment), but the home I’m in is on a 40×100 plot, and it’s 40 minutes away from Manhattan by bus/subway. And I never owned a car or had a driver’s license. The idea that you need 3/4 of an acre and 3000 square feet for a family of 4 is a bill of goods bought to you by big oil, big auto, and big real estate. If home ownership is your dream, most homes in urban areas fit the bill just fine. They’re also generally built better than the cheap wood frame and shingle garbage which passes for housing in suburbia. Remember, it’s still illegal in most places to build smaller or attached homes, mixed-use developments, and developments with minimal parking. Polls show that a lot of Americans do prefer walkable neighborhoods and town centers, but can’t find (or can’t afford) a home in their desirable type of neighborhood.